Managing email enquiries from your inbox can be daunting, especially when using a shared mailbox or email alias for multiple users. Often, these lead to confusion as to whether the enquiry has been attended to, thus resulting in a delayed or even lack of response. E.Engage works great for both small and large businesses. Small businesses and entrepreneurs can use this centralised platform to digitalise their enquiry management process. For large organisations, the IT or operations teams can automate their incident ticketing within the company. Audit trail of new, pending and resolved enquiries. Encourages self-service among employees within the organisation to log incidents for troubleshooting. 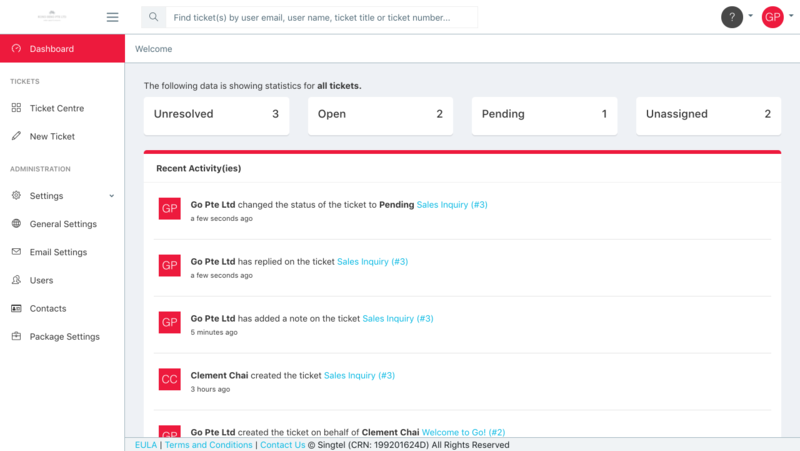 Customisable ticket categories and severity levels. Allows attachments of up to 2MB. Add internal notes that are only visible to your employees to discuss on a certain inquiry before responding to it. Every enquiry will have a status tracking – Open, Pending and Resolved. 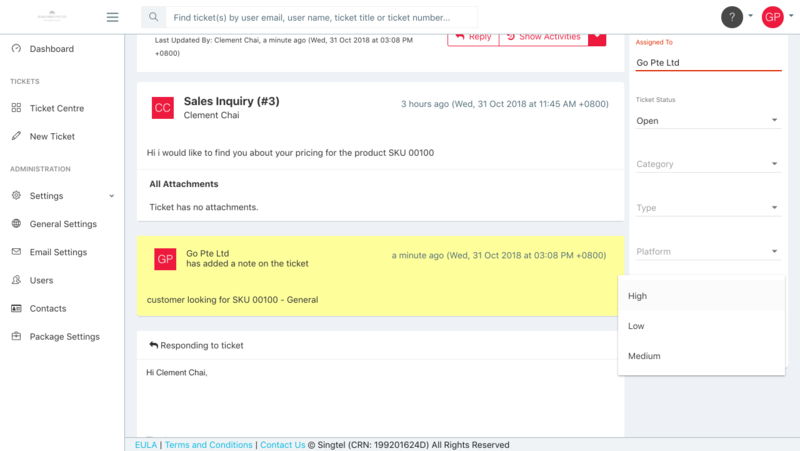 Quick search and filter by name, email address, or ticket number. A status summary of all conversations helps you to prioritise the enquiries that are urgent. Incidents can be sorted by date, status, priority and supporting officers. A list of recent activities shows the latest status of each ticket conversation. .csv files can be generated and downloaded for management reporting. A common issue is that emails sometimes get forgotten as there is no tagged status. With E.Engage, track and answer customer inquiries, and keep customers satisfied with timely responses. Keep track of your sales by having the right people (eg. product specialist) in the conversation. E.Engage can be used as a lightweight customer relation management (CRM) tool to track the status of a sales process. E.Engage can be used for operational tracking . If you have a system that sends and receives updates via email, forward the email to your E.Engage and it will be treated as a ticket. You can tag a status to the ticket, categorise and assign it to the parties involved. Similar to customer support, you can support your internal IT needs using E.Engage. Enable your organisation with a system that keeps track of their tickets issued or service requests. Employees can have their unique login ID to view records of their inquiries on the support portal. Easy-to-use interface with zero programming needed. Trouble tickets, replies and internal notes organised clearly. Reduced human error and up-to-date information, With historical data easily retrieved. Data is saved on an ISO-27001 certified secured data centre with encrypted network and 99.5% guaranteed SLA uptime. No additional password needed - login with Microsoft. Password and logout session policies for users. Accessible from any computer or mobile device. Get notifications and replies directly via email. E.Engage has a default email address e.g. yourcompany@mail.engage.singtelmybusiness.com to collate your incoming enquiries. You can set up the email forwarding feature from the current mailbox that is receiving enquiries to E.Engage. Can I download the enquiries? Yes, currently you can download and export the reports in .csv format. What type of user roles are there? Administrator: This is usually the owner or team lead, whom wants to have visibility of all the enquiries. Agent: Can only viewed enquiries assigned to him/her. Consists of mainly sales people or customer service officers who front the customers or external parties directly. What happens when I reach my monthly usage quota? New incoming enquiries will still be created and be visible on your dashboard. However, they will not be accessible. Once the plan has been upgraded with an increased quota, access to the enquiries will be granted.